It is July fourth, and I note there are only 40 days left until Lafayette players will report for preseason on August the thirteenth. As I have been a long time fan of college field hockey, a new season is a time to think about future prospects and hopes for the season, it also is for me, a time to reflect upon history. Division one college hockey has had a remarkable evolution over the past 40 years as Title IX of the civil rights act in particular, and american culture in general has had a tremendous impact. As any fan can attest, this it not the same game played by the grandmothers, and mothers of today’s players. The invention of artificial turf, the attention to fitness, and evolving athleticism has made this game more demanding and crowd pleasing. As a result we have seen young women discover the joy of team sport. Fans today witness a game with evolving rules ,including the elimination of the offsides, self start off a foul, and this year the ability to raise the stick above the shoulder. The use of the ariel pass in recent years is as much a change in the game as the forward pass in american football 70 years ago. 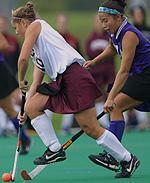 It wasn’t until 1990 that the first Patriot League field hockey season was inaugurated. Since that time, Lafayette field hockey has garnered an enviable record, collectively and individually. Lafayette is located in the Lehigh Valley where high school field hockey has flourished producing numerous olympic players. It is in this atmosphere that Lafayette has established a legacy to be envied. Let’s go down the list of all time records. In career assists there is a Lafayette player in the first,second,third, eighth,and ninth spot. Emily Valeo,Meredith Hahn,Deanna DiCroce, Jennifer Stone, and Megan Monahan are the owners in that order of that record. Those same names in a different order appear in the record for assists in a single season with Deanna holding the single game record of 6. Kelsey Andersen is third in goals against in a career with a 1.37 average. Danielle DeHoratius in 1994, posted the all time goals against average in a season of .63 and Jackie D’Angelo is second with a .67 season average in 1990. The latter two share the record for save percentage at .91 in a season. In 1994 Lafayette set the record for fewest goals allowed at 15. Lafayette holds the record for consecutive victories of 19 set in 2002. Offensively you will see a host of players in goals and points scored. Leopards are ranked first, second, and sixth in career points from Megan Monahan, Deanna DiCroce, and present coach Jennifer Stone. Monahan leads all patriot league players with a gaudy 80 points in a single season, Suzy Farrell is second with 70 points, DiCroce is third with 51 points, Stone is fourth with with 50, Kelly Salber is ninth, and Monahan is tenth having had two high scoring seasons in her career. Megan Monahan is the all time goal scorer with 65 in her career with the nearest player six goals away. Farrell and Monahan share the season title with 33 and Jen Stone is third with 24,Salber is fourth with 20, DiCroce is 10th with 18 sharing that spot with Monahan who did it in her junior season as well. There are other records but I might run out of space. Legacy means something in sports. As today’s players step on that field in August they are standing on the accomplishments of others. No doubts some of the records I named above will be broken. It would be my hope when recorded there will be Lafayette after the name.